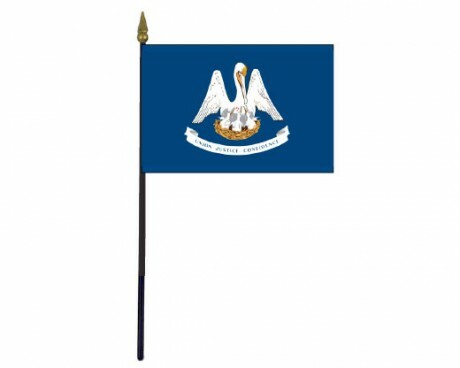 Louisiana State Stick Flag - 4x6"
The current state flag of Louisiana has been in use for less than a decade, but the fundamental aspects of the design have been in use as part of the state flag for more than a century. Louisiana state flags have blue fields that feature a pelican feeding a nest of her chicks above a ribbon that displays the state motto of Louisiana. Three little drops of blood are on the pelican's chest. 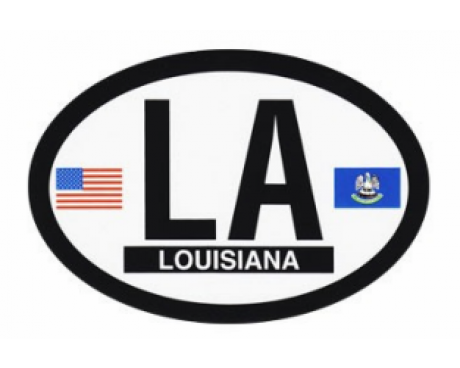 The emblem comes from the seal of Louisiana, and it reflects both the state's religious heritage and its origins as a French colony. The pelican's wings are outstretched so that she resembles a fleur-de-lis, which is a symbol of France that eventually became a symbol of Louisiana. The pelican is also a symbol of Christian piety and charity that has been used in the Catholic church since the medieval period. Louisiana began as a French colony, and during that time it was represented by the royal banner of the French king. Part of the state also spent time as a Spanish colony, and that area used the banner of the Spanish king instead. 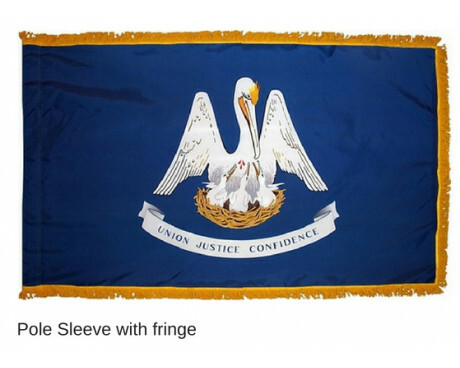 They fell out of use when the United States purchased the Louisiana territory, and Louisiana spent many years without an official flag. Many citizens used an official state flag of Louisiana that consisted of the French flag with a ring of white stars in the canton. 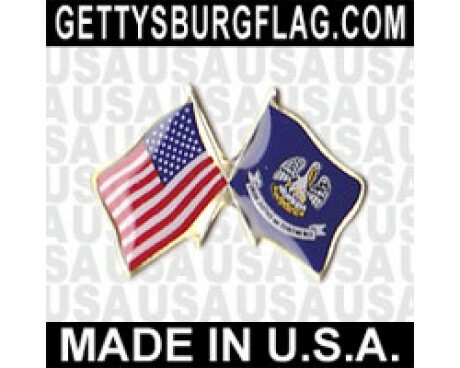 The first of the official Louisiana state flags came into use after the state joined the Confederacy in 1861. It had thirteen alternating stripes of blue, white, and red with a red square that displayed a gold star in the canton. The earliest form of the pelican flag came into unofficial use at the same time, and it remained popular after the end of the Civil War. The state officially adopted a refined form of the design in 1912, although the original pelican flag also remained in popular use. The flag was supposed to feature three drops of blood on the pelican, but many flags lacked that feature. The matter was clarified in 2006, and the flag reached its modern form after a few subtle changes were made in 2010. 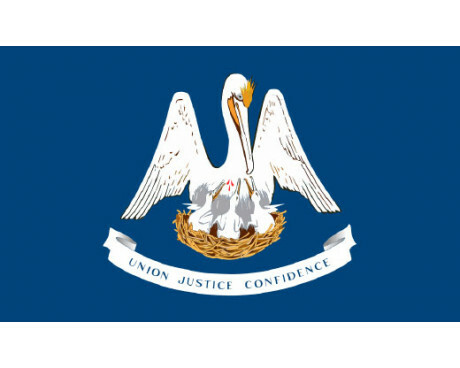 In 1812, Louisiana achieved statehood, and the pelican made its first appearance on the state seal. No other information regarding the original seal is available. 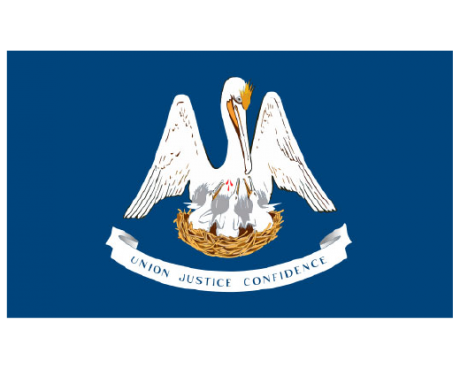 The pelican made a re-appearance on the state flag in 1861, when the state seceded from the Union. In 1864 Louisiana had rival governors, with the Federal governor using the word "Union" in his seal, and the Confederate one employing the word "Justice", both words being taken from the state motto. By 1902, a new state seal was created and in place of a natural pelican it was decided to use a heraldic one. Prior to 1803 Louisiana was the name of the whole territory drained by the river and its tributaries. In 1682 it was claimed to France, and ceded to Spain in 1763. In 1803 ceded to the USA. Louisiana became a Territory in 1804, and gained statehood on April 30, 1812. 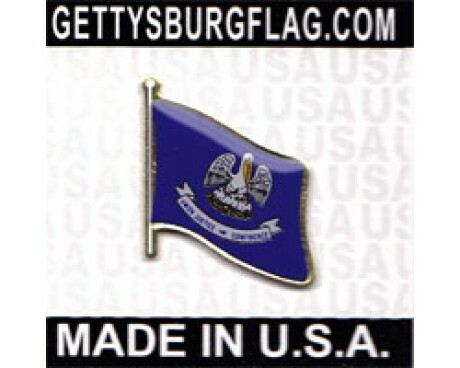 It seceded in January 1861, and was re-admitted in July 1868.